Through the sacraments of initiation we come to share fully in the life of God. However, the new life God gives us can be weakened and even lost, because of sin. Therefore, Jesus willed that his Church continue his work of healing through the sacrament of penance and reconciliation. We read in the Catechism "Christ instituted the sacrament of Penance for all sinful members of his Church: above all for those who, since Baptism, have fallen into grave sin, and have thus lost their baptismal grace and wounded ecclesial communion. 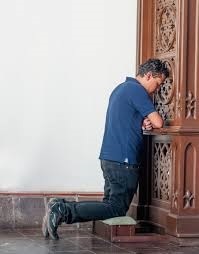 It is to them that the sacrament of Penance offers a new possibility to convert and to recover the grace of justification. The Fathers of the Church present this sacrament as "the second plank [of salvation] after the shipwreck which is the loss of grace" (1446). Contrition - Contrition is a clear and decisive rejection of the sin committed together with a resolution not to commit it again. We read in the Catechism "Among the penitent's acts contrition occupies first place. Contrition is "sorrow of the soul and detestation for the sin committed, together with the resolution not to sin again" (1451). Confession - accusation of sins. Absolution – God absolves all sin through the ministry of the priest. Satisfaction –the penance imposed by the priest help repair the damage caused by sin. The sacrament of reconciliation makes two clear distinctions between grave and venial sin. Grave (mortal) sin is an act that destroys our communion with God. It must be committed with full knowledge and deliberate consent, i.e., one must really, freely want to turn away from God. Although this is hard to do, as often mitigating circumstances reduce the severe nature of these acts, some acts are intrinsically disordered (Catechism, 1753, 1758). Any sin that is not mortal is termed venial. Although venial sin does not result in a complete separation from God, it degrades the divine life given us through faith and the sacraments. The most important aspect of confession is a thorough examination of one’s conscience to know what sins we have committed. So even before we make our confession we need to prepare ourselves well. During this process, the admission of sin normally moves us to contrition because we feel sorry for what we have done. When you have reached this stage, you are ready to confess your sins. The priest will normally respond to you by addressing the areas that are troubling you. Then he will give you a penance. You are accepting that you must make satisfaction for your sins by agreeing to the penance, saying “Yes father” or similar words. The priest will dismiss you and then you are to make your act of penance (satisfaction).